AHAdams&Company was commissioned to renovate a tenant space in a suburban industrial building for Bostik, a division of the French oil company TOTAL. This project was part of the continuing expansion and upgrading of Bostik’s research and development division, to support TOTAL Oil Company’s goal of Bostik to becoming the largest adhesive manufacturer in the world. Currently, Bostik is the world second-largest manufacture of adhesive, with sales in excess of four billion dollars a year across diverse markets and industries. A goal of the Bostik’s R&D facility was to create a facility which would allow research engineers to develop new adhesive technology in a collaborative and creative working environment. After facility programming was completed, Bostik and AHAdams&Company engaged in a creative dialogue which developed a goal. Research staff needed spaces to interact with support and marketing personnel. Initially, new office areas were programmed to be adjacent to the R&D laboratory areas. With complex chemistry of new adhesives, there was a need to encourage communication and opportunities for discussion of developing technology across product lines. Programming added an “idea area” to be included in the new R&D facility. 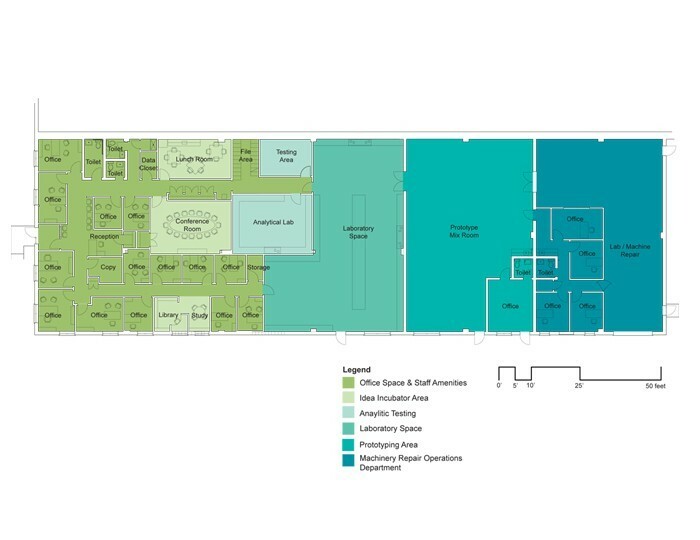 The “idea area” was envisioned as a location within the R&D offices, adjacent to the lab area, where informal discussions could be held to discuss new technology, as well as review market direction and initiatives; an area devoted to the exchange of ideas. Utilizing daylight provided by existing wall openings, the “idea area” was created adjacent to the R&D labs, where engineers, sales, and marketing staff can interact. 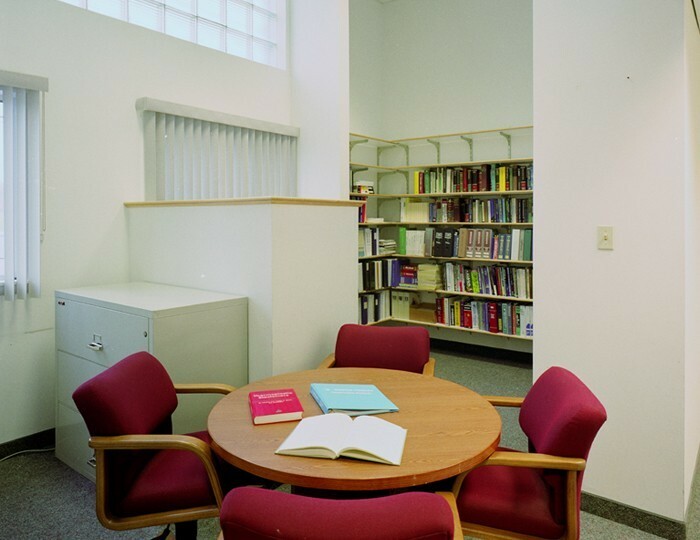 The area is provided with lounge chairs, tables, bookcases, full computer resources, research literature, and publications. The “idea area” is within the office area and adjacent to the labs. This placement allowed the breakout of spontaneous brainstorming sessions, interaction, and dialogues which can begin in a research engineer’s private office, and then move directly to the lab or idea area — allowing for quick discussions which promote the free flow and exchange of ideas as the need arises. 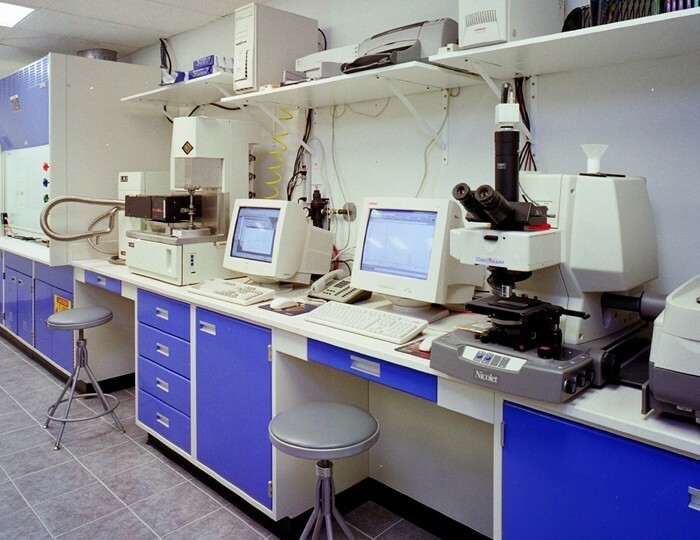 A major component of the design of the Bostik R&D laboratory was to create an interior environment which would encourage and promote the interaction of research staff. The office and “idea areas” have been provided natural day lighting to reduce energy utilized for artificial light and to create places which are visually accessible for natural light, prompting a work place connected to the natural order of which we, as human beings, are all part. 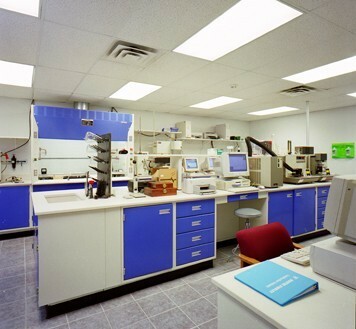 Bostik R&D laboratory facilities allowed for research engineers, marketing, and administrative employees to interact in spaces designed to enhance and promote dialogue. This new R&D facility has been successful, and its concepts and layout have been duplicated in Bostik’s new larger R&D facility, which is currently under construction.